Why does anything remotely technical always have to be covered, protected or held in some horrible black or grey ugly nylon concoction? Why can't it be something colourful, stylish or pretty? Little Miss got a camera for Christmas. 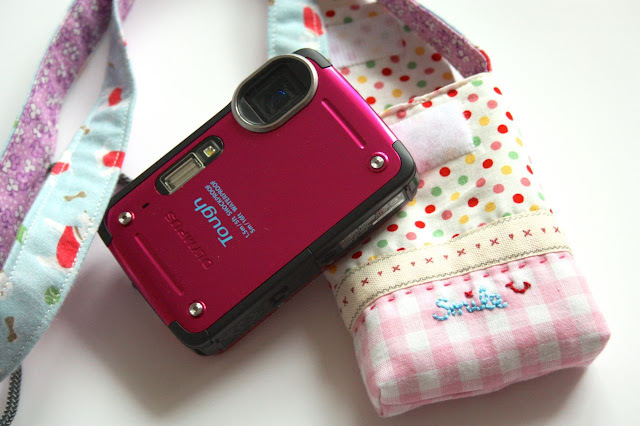 Digital cameras, perfect technology for children. They can (and will) take a 1000 shots, but thankfully, you only need to keep the one or two good ones. Mind you,she's not alone in this family with that photography technique! But of course, it came, as these things always do, with a absolutely horrible, black, dreary, dull shapeless sack that was suppose to act as a carry case. It looked ghastly, was horrible to touch and quite frankly didn't really do a great job of actually holding the camera safely. Time for me to step in a remedy the situation. I summoned my Little Madam to my little craft room one day before school and told her of my plan and asked her to select some fabrics she liked. I gave her free rein and she picked out her favourites. She made some good choices but I have to say that the purple was a bit of a stumbling block for me at first. I couldn't get anything working together until I suddenly hit upon the idea of adding in the ribbon. Then I was away. I'd like to say that it was plain sailing after that but quite frankly I made a right meal of the whole thing. I miscalculated, I cut the wrong size fabric, I sewed wrongs sides together. All in all I made my own life extremely difficult. I even sewed the whole thing together at one point before then deciding that the corners should be done differently. I almost, almost gave the whole thing up as a bad job. But... I didn't. I stubbornly, annoyed by my own daft mistakes, ploughed on with it. And, I'm so glad that I did. Because when I'd finally pulled it all apart and put it together again, suddenly there was a cute, colourful and functional camera case in front of me. It holds the camera snug and safe and I added a strap so she can hang in around her neck and have it with her whenever she wants it. I love it. And, thankfully, so does she. I'm so glad I persevered with this one, it was absolutely worth all the unpicking and re-sewing to have it come out just right in the end. And I'm ridiculously pleased with how my strap came out. 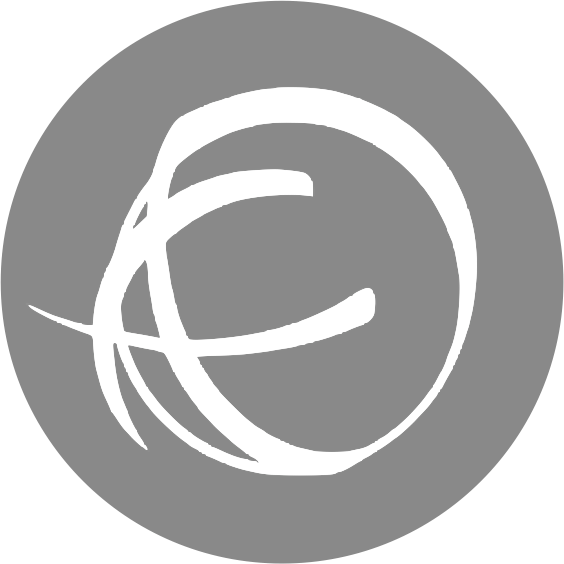 I feel that it looks most professional. My sewing is getting better at last. Giddy with the sucess of that camera related prettification, I cast around for a way to add some colour to my own camera. Ah ha, what about one of those pretty camera straps that I've seen people make? I thought to myself. That would do the job and add a little cute to my camera! So, the next day I rushed through my jobs and zoomed up to the craft room to get started. I had a couple of new fabrics arrive that day too, so what better way to show them off? Funnily enough, this time things went together like a dream. The lens cap pocket I planned went... well, to plan. 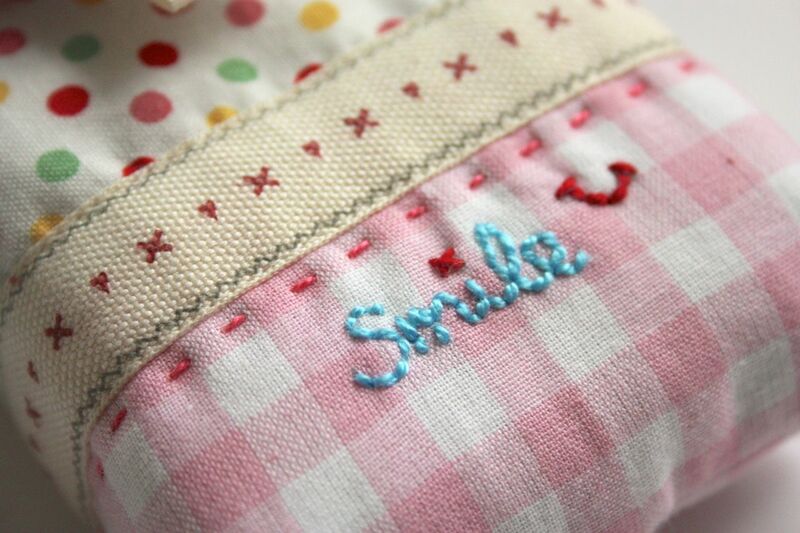 And my new fabrics looked a cute as a button. Of course, it was all far to good to be true and sure enough when I clothed my dear, trusty campion in his new garb, I found that the strap was a bit too short. It had actually been my intention to make the strap a bit longer than the old one, so how it ended up shorter, I couldn't really say. Sometimes I think my head is just fluff, no brain at all. The trouble is, I just can't face pulling this apart when it all fell into place so beautifully. I'd have to re-make the whole thing really to get it right and I just haven't the heart for that. My oldest is rather crafty herself and has crocheted covers for all of her electronics *wipes brow* I'm loving your fabric creations! Your camera case and strap are just adorable!! I love the fabric choices too! 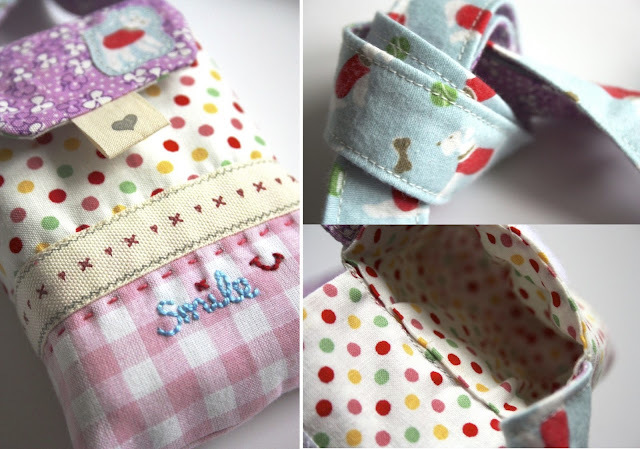 The camera case you made for your daughter is perfect! I bet she'll be the envy of her friends. 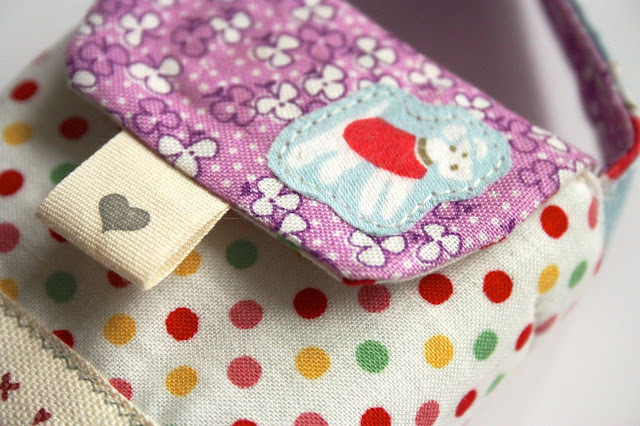 :) You gave me a good idea for 'prettying up' my camera case. I quite like the idea of your camera strap and it looks good. Thank you for sharing your ideas. 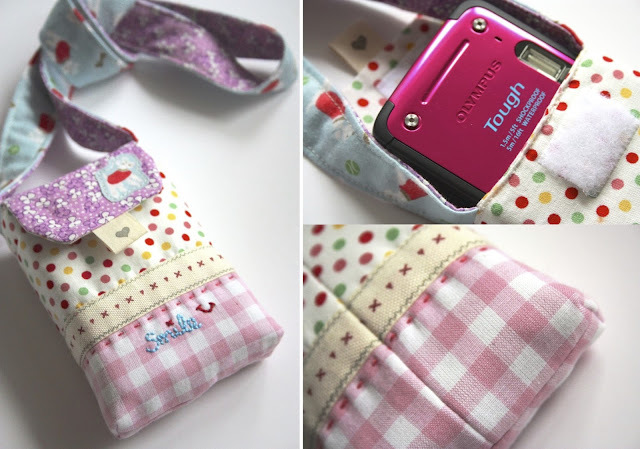 Wonderful little camera bag for your girl. You are so good with all that fiddly stuff... I'm not. And what a clever idea with the camera strap... I still don't have a big camera like that... I have one made for film... Very clever little pouch for the lens cover. It's in the detail... Well done Sandra. What a cute and functional camera case for your daughter's new camera. I like the embroidered word 'smile' and the smiley face! 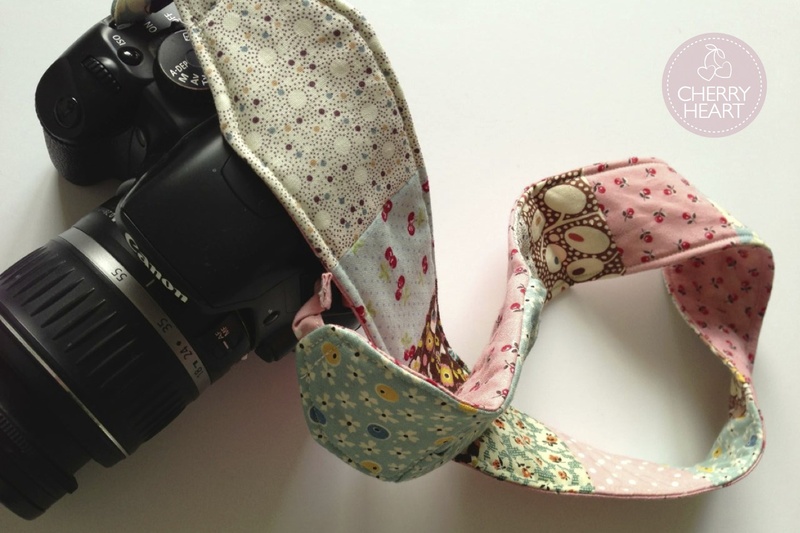 Your own camera strap is such fun too and with an extra clever little pocket for the lens cover! I'm hopeless at sewing, the needles keep pricking me and I can't sew straight! Grrrr! Have a wonderful Easter! What a cute and clever camera case. You are so talented with the designing thing. BTW, I made up my own version of your bee hive pillow from last year. I had bookmarked it and finally did it. I love how it turned out. Thanks for the inspiration! I've seen those gorgeous camera straps! 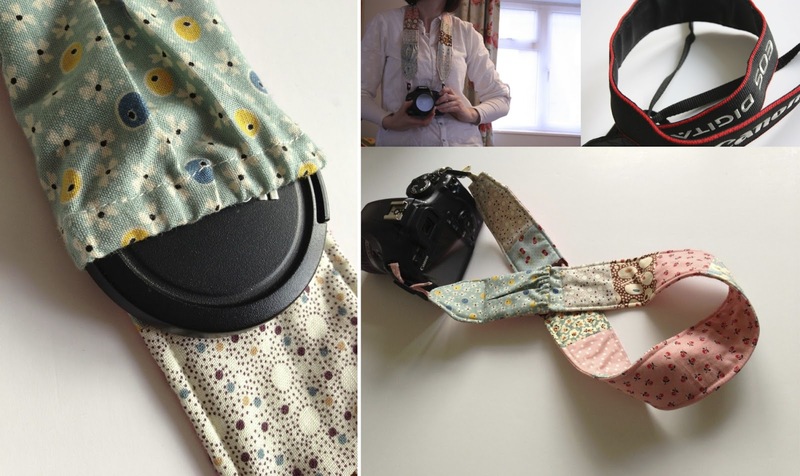 I want to make one for my Nikon too... And what a great idea with the lens pouch! Would it be possible to length the strap a little at each end by extending whatever attaches it to the camera (I can't quite see how's that's done in your pics). 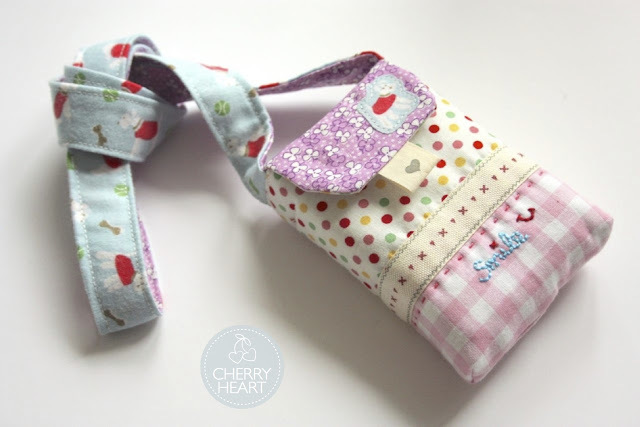 The camera case is so pretty, I would love to have one for my little camera I bet your daughter was pleased as punch with it and your camera strap is fab too. The things you make are always gorgeous but I must say it warms my heart when you speak about your mistakes because your finished products are always wonderful. It gives me hope as I am very new to sewing and most of the things I make are well to be quite honest pretty ropey :) but I will battle on until something comes out that is of average quality. I wish I could do one for my big camera - it's not super huge but it's a dslr, not a point and shoot. I'm stuck with an industrial looking black ugly lunchbox for a tech nerd, which I'm not, instead of something pretty for a crafty nerd, like I am. Both camera projects turned out so well...Congrats! wow this is gorgeous. Your so crafty! !